Homeowners 62 and older who have paid off their mortgages or have only small mortgage balances remaining are eligible to participate in HUD's reverse mortgage program. Homeowners can receive payments in a lump sum, on a monthly basis (for a fixed term or for as long as they live in the home), or on an occasional basis as a line of credit. Unlike ordinary home equity loans, a HUD reverse mortgage does not require repayment as long as the borrower lives in the home. Lenders recover their principal, plus interest, when the home is sold. The remaining value of the home goes to the homeowner or to his or her survivors. 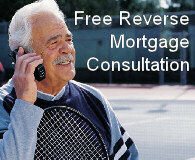 There are no asset or income limitations on borrowers receiving HUD's reverse mortgages. Also according to the Reverse Mortgage Information site there are no limits on the value of homes qualifying for a HUD reverse mortgage.